We’re all familiar with requests like, “Go green, go paperless,” “Please consider the environment before printing” and “Think before you print.” While these requests are based on good intentions, they’re also rooted in some common paper myths. The truth is that when it’s sustainably sourced and manufactured, paper is a responsible choice. Careful paper manufacturers such as Domtar work hard to minimize their products’ impact on the environment. Forest certification and chain-of-custody (CoC), which has existed for more than 20 years, helps ensure a transparent supply chain. Moreover, paper is one of the most recycled products in the world, speaking to the industry’s leadership in one of the most important aspects of sustainability. What are the most common paper myths? And how can we set the record straight? Each year, Dan Persica, Domtar’s sustainability communications manager, delivers a presentation on the environmental attributes of paper at the National Paper Trade Association’s Paper School. 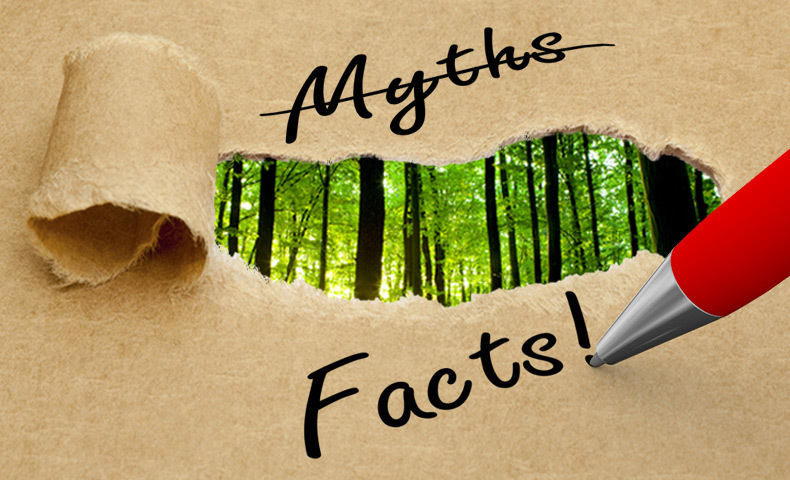 As part of that presentation, he debunks three paper myths about the industry’s impact on our planet. Paper Myth #1: Paper production causes deforestation on a massive scale. Paper Reality: Other industries contribute far more to deforestation than paper. Several surveys have shown that people believe the paper industry contributes to the loss of tropical forests. However, the Rainforest Alliance notes that agriculture expansion is responsible for 70 percent of global deforestation and is the greatest threat to tropical forests. That’s because products like palm oil can be found in nearly everything, from cosmetics to food, and the growing demand for that product often requires agricultural expansion into once-forested areas. In addition, several environmental groups report that cattle ranching has caused up to 70 percent of forest loss in the Amazon. In the United States, the paper industry ensures that more than twice as much wood is grown as is harvested. In fact, the net total U.S. forest area has increased by 3 percent in the past 60 years, and the net volume of trees on timberland has increased 58 percent. In Canada, forest cover has remained stable, with less than 0.5 percent of Canada’s forest harvested annually. Paper Myth #2: Paper is wasteful. Paper Reality: Paper is one of the planet’s most recycled products. Most people would agree that a product is green if it is reusable, recyclable or comes from sources that can be regenerated. Paper wins on all counts. A 2013 U.S. Environmental Protection Agency study on solid waste generation recycling and disposal found that more than 63 percent of paper in the United States is recovered for recycling. As of last year, that number increased to nearly 67%. The paper industry’s goal is to see that rate climb to 70 percent. Also, did you know that paper can be recycled five to seven times? That’s something to cheer about. Paper Myth #3: Harvesting trees to make paper is bad for the environment. Paper Reality: Sustainable forest management benefits people and the planet. Paper is highly recyclable, but it can’t be recycled indefinitely. Virgin fiber is necessary to produce the paper products that we depend upon in our everyday lives. If we were to only use recycled fibers in our products, we would run out of printing paper in less than a year. But when we sustainably source our wood fiber and properly manage our forests, we can get the paper products we need while still protecting our natural resources. Domtar is committed to maintaining the highest level of assurance via third-party CoC certification. Such certification protects the interests of our landowners, preserves our forests and ensures that consumers can be confident in their purchases of paper products, such as items from our EarthChoice product line. We also partner with some of the world’s best-known environmental organizations to raise awareness of the need to protect our vital natural resources — including our forests. Domtar is proud of how our industry manages and protects its most vital resources. To stay up-to-date on our latest sustainability efforts, subscribe to the EarthChoice Monthly Minute newsletter or read related articles on the Newsroom. Why Does the FSC Label Matter? You can also learn the truth about other paper myths through Two Sides North America. This organization promotes sustainability within the graphic communications industry, which includes forestry, pulp and paper.